Shortly before noon on January 6, 1943, a PBY-5A plane of Squadron 83-P-2 was returning to its base at Natal, Brazil, from a patrol. According to her report, a white streak on the horizon attracted her attention; she found that it was caused by a U-boat traveling on the surface. Keeping a cloud between herself and the enemy, she got into position and dived to deliver an attack with four Mark XVII bombs set at 25 feet, releasing three of them simultaneously and the fourth a split second later. The attack was made eight minutes after the target was sighted, from a height of only 35 feet. The U-boat maintained the same course and speed throughout, and the decks were not yet awash when the bombs exploded. Several men were seen lying on deck, apparently sun bathing, and these leaped up only a moment before the drop was made. The position was 01º 58" S - 39º 22" W, only 65 miles from land, and the hour was 11:53, local time. Two explosions were observed. One was very large, about five feet to port of the U-boat and abeam of the conning tower, and was apparently caused by the first three bombs exploding simultaneously. The second was smaller, about 60 feet to starboard and slightly abaft the conning tower, and was undoubtedly the fourth bomb. 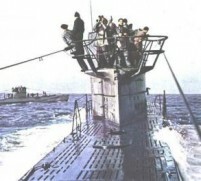 The stern of the U-boat appeared at the forward edge of the large TNT residue spot, rising almost vertically eight to ten feet out of the water, bobbing up and down. It stayed there for a time estimated as 25 seconds to three minutes, and then sank straight down. The plane observed much evidence of damage. The U-boat appeared to rise out of the water and to break at least partly in two pieces. Three large tanks, thought to be about 20 feet long, emerged from the broken area as the bow settled under. Much miscellaneous debris was briefly seen before it disappeared. The observers reported seeing several mangled bodies, and also three men alive, one of whom may have been killed immediately by the gunfire with which two of the three tanks were sunk. On the return of the plane, one man had disappeared, one was clinging to the top of the remaining tank which was floating vertically, and one was still in the water. Two rubber life rafts were man in the water succeeded in reaching the second one. He paddled it to the tank and took his comrade aboard. The plane then lost contact because of the rough water, and could not regain it during a search continuing for over three hours. The two men last seen on the raft are the prisoners upon whose statements this report is based. Their account of the event agrees in the main with the plane's report, but differs in some details. They were on the deck at the time of the attack, but they were bathing, not sunning themselves. Their watch on the bridge had just been relieved, and after going below the two survivors camp up again for a few minutes. Upon sighting the plane they dashed up to the bridge, but found it deserted and the hatch already closed. The water was just breaking over the bow of the U-boat as she began her dive. It was at this very moment that the bombs exploded. The two men were blown from the bridge into the water, and it seems quite possible that they were a few moments regaining complete awareness of the scene around them. Yet they were able to give a fairly good description of it. They identified the three tanks as upper deck torpedo containers that had been blown loose. They saw the stern of the boat rise up out of the water and go down almost vertically. They denied, however, the presence of a third swimmer, and said they were definitely the only ones locked out or swimming in the water. They also denied emphatically seeing any mangled bodies. They were consequently, quite strong in their belief that the U-boat might have escaped, and were skeptical of the suggestion that she had been sunk. It seems hard to believe that U-164 could have survived such a severe and well-placed attack, and it must be borne in mind that the survivors could have been prevented from seeing all of the evidence of damage by the rough condition of the water, and the fact that the U-boat made no known effort later to pick up the men she had deserted. On the other hand, it is quite possible that what appeared to the plane to be the U-boat breaking in two may very well have been only the superstructure being blown up, that the debris may all have come from the storage space under the deck, and that what appeared to be a vertical sinking may have been the conclusion of a steep dive which the prisoners knew the boat had begun. It seems, therefore, that the fate of U-164 must remain uncertain for the time being.